Finally I have made the true gardener's pilgrimage - to Sissinghurst Garden in Kent. Now I can chat about THE most famous white garden in the world. I can hold my own in gardening small-talk. Yippee! The sign on the road had Moosey the Navigator fooled, though, and our car missed the turn-off accordingly. This is definitely an old person's tour destination - the Devonshire tea cream cake sign is bigger than the flower picture. The National Trust's cute little acorn symbol is oh so unobtrusive. 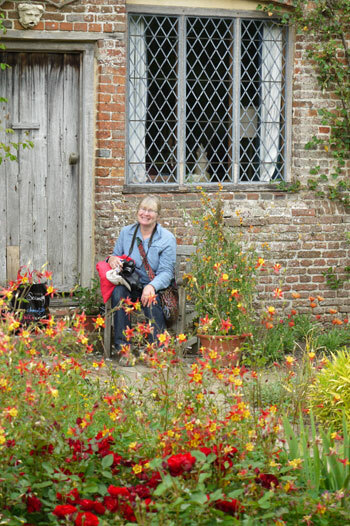 Did I like Sissinghurst? Well, I saw many plants that I liked - foliage and flower plants that I'd not seen before, but which looked very growable in a New Zealand garden. I never know whether they're weeds (aargh! ), dead common (yawn), or terribly special (shriek with amazement). In one of the garden rooms I saw masses of the humble yellow and red aquilegia They'd all synchronised their flowering time, and were teamed up with yellow perennials (low flowering Oenetheras and Irises), yellow foliage plants (Acorus and Choisya Sundance were two that I noticed), and red things like Alstromeria and roses. 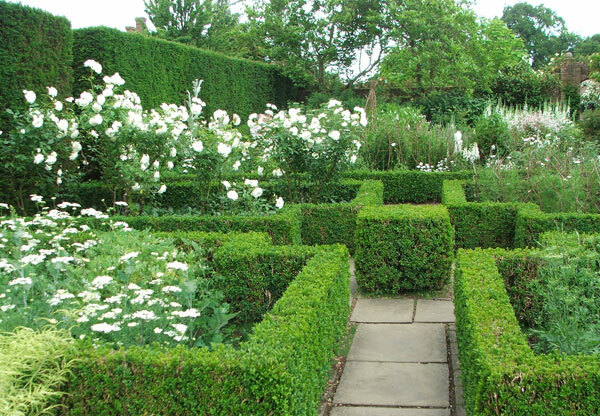 The garden at Sissinghurst is heaven on earth for the lover of the right-angle and the straight and narrow path. Garden rooms, of course, are suitably rectangular or square, and Sissinghurst is possibly where these rooms were first 'invented'. The National Trust describes these rooms rather cutely - as 'small enclosed compartments'. All over the world there are other sets of garden rooms, often colour themed, inspired by those at Sissinghurst. The rose lover will find beauties climbing up the warm brick walls, and old fashioned shrubs sitting in the unmown paddock grass past the house. 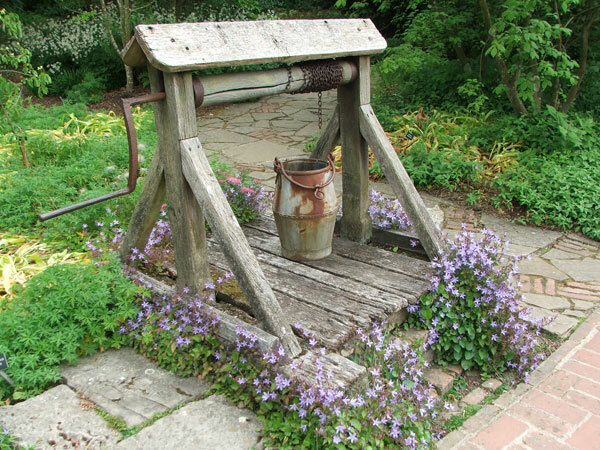 Lovers of the picturesque rustic (I confess I'm one) can find plenty of garden ornaments to photograph. For me the brickwork was absolutely fascinating. 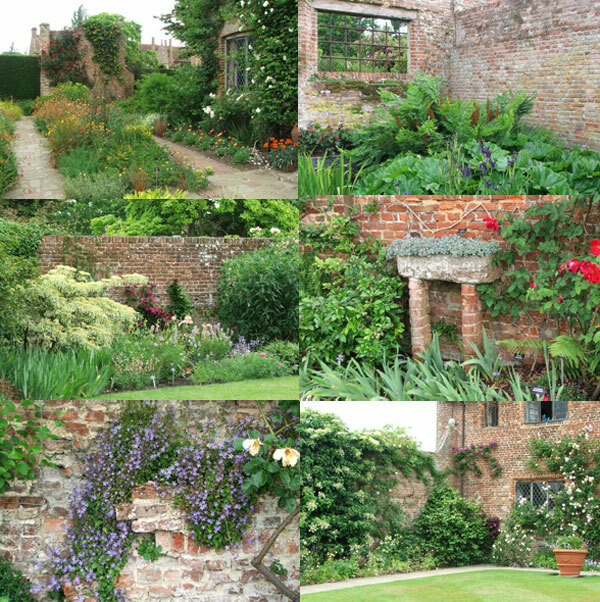 Back home (in New Zealand) there's little of this - no Victorian walled gardens for garden visitors to become complacent about. Bricks contribute warmth and colour, and look great with greenery. 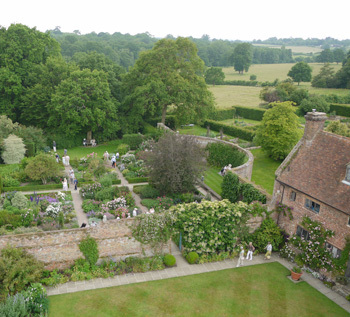 So now I've been to Sissinghurst, and it doesn't really matter whether I personally liked the garden or not. 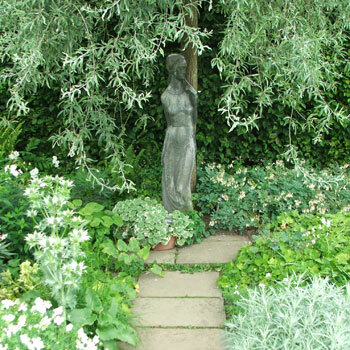 Sissinghurst has to be like it is - a faithful rendering of a historical gardening place. But I could sense some light touches of individuality from the Official Gardening Team. Nice. So I'm glad I went. And I've seen that famous white garden which has inspired millions of non-famous replicas in all corners of the gardening world. Tick.